Kaohsiung, Jan. 22 (CNA) The latest minehunters added to the Taiwan's arsenal were shown in public for the first time as the country's Navy held an anti-submarine drill Tuesday to highlight its combat readiness. 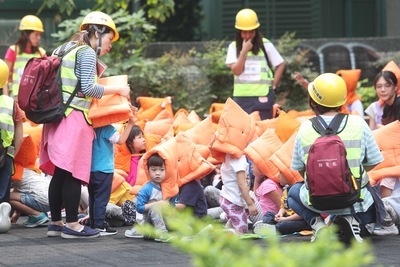 The exercise, which was open to the media, simulated an emergency in which the Navy dispatched a frigate from Tsoying naval base in Kaohsiung to counter a potential submarine attack by enemy forces. The Dyihuah frigate -- one of six Lafayette-class ships purchased from France in the 1990s -- sailed into the Taiwan Strait accompanied by two retrofitted U.S.-made coastal minehunters deployed to keep the sea free of mines and two Chengkung-class frigates. Taiwan received the minehunters last August and were exposing them to public scrutiny for the first time Tuesday. An S-2T anti-submarine aircraft was then dispatched to locate the opposing submarine, followed by an anti-submarine S-70C helicopter sent out to deploy dipping sonar systems to confirm the location of the submarine. The submarine was finally pushed to the surface after the S-70C launched a simulated attack by firing a torpedo, concluding the drill. Naval officials said the exercise was held to highlight the military's efforts to stay alert and strengthen combat readiness ahead of the upcoming Lunar New Year break in February.